Detailed documentation and accurate diagnosis coding are critical for proper risk adjustment. Purchase Risk Adjustment Documentation & Coding today! 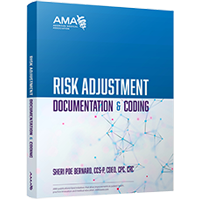 Code abstraction guidelines and best practices to improve diagnostic coding accuracy without causing financial harm to the practice or health facility. Chapters dedicated to delivering an overview of risk adjustment, common administrative errors, best practices, an alphabetized, topical review of clinical documentation improvement and coding for risk-adjustment, and guidance for development of internal risk-adjustment coding policies. Appendices offering mappings, tabular information, and documentation and abstraction training tools for coders and physicians that include an alphanumeric mapping of ICD-10-CM codes that risk-adjust to HCCs and RxHCCs for Medicare Advantage plans.